As usual with bilingual Toyota sign, the English is not great and the translation not perfectly accurate. With its tens of thousands of American employees, you might expect Toyota to use writers who know better than to mix nouns like “Teamwork” and a sentence like “We love Toyota” as items in the same list. The title is accurate. In the US, however, the word “attitude” is mostly used when it needs an adjustment. “Our values” or “our principles” would better reflect the spirit of the list. In item 2, the Japanese word is actually the transliteration of the English one. There is a perfectly suitable, common everyday Japanese word for challenge, Chōsen (挑戦), and I don’t know why they chose to use the English word instead. In item 4, it’s the Japanese phrase that is transliterated, and it is repeated in the explanation. You shouldn’t use “Genchi Genbutsu” to explain what it is. Item 5 is also a transliterated Japanese phrase and one that I hadn’t seen before. “Shitsujitsu Goken” translates to “unaffected and sincere.” Contrary to what the explanation says, it’s not about spending money. 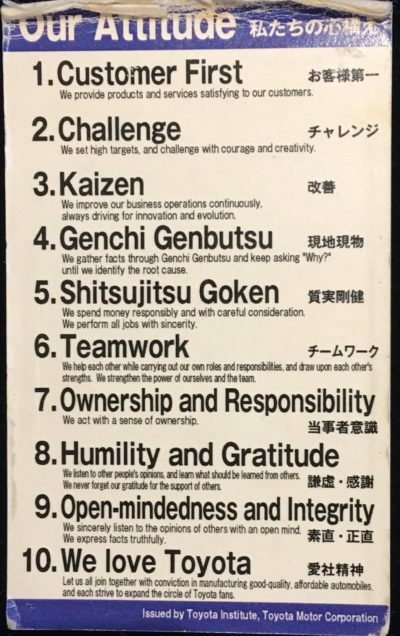 In item 6, as in item 2, the Japanese word is a transliteration of the English “Teamwork.” It had never occurred to me that there is no native Japanese word for team or teamwork. There are words for groups, factions, cliques, or gangs but, for “team,” they borrow an English word! In item 7, the Japanese word Tojitsushaishiki (当実者意識) means “consciousness of being directly related to the matter.” It’s not an exact match for “Ownership and Responsibility” but it’s close enough. In item 9, Sunao (素直) and Shōjiki (正直) both translate to “honest” and neither one means “open-minded.” Sunao has the connotation of being dutiful and deferential; Shōjiki, of having integrity and being frank. In item 10, the translation is reasonably close, but loving the company is not usually required of employees. It is something that management could hope for as a result of excellent leadership but not mandate. Go to the shop floor. Take ownership of your work. Act humble and grateful to others. Very very nice post. That the “mind and attitude of Toyota” can be distilled into such simple and correct directives — wow! Thank you. This "respect for people stuff"